Today, B2B marketers are under more pressure than ever to prove their effectiveness to the business. It's no longer enough to talk in wooly terms about 'engagement', senior management want to hear about the numbers. But, as anyone in B2B marketing knows, providing empirical evidence that draws a straight line between marketing activity and revenue is tough (especially for complex sales with multiple touchpoints and a 9 to 12 month cycle). While they're not there yet, modern attribution methods are nudging in the right direction and being adopted by many marketers. But, even the term 'attribution' itself doesn't tell the whole story. What type of attribution do we mean? And what effect will your choice of attribution have on your wider marketing programmes (and bottom-line effectiveness)? To learn more, as part of our Revenue Rift research, we asked mid-market and enterprise marketers how they were approaching attribution in their businesses. We started by asking whether they even need to prove effectiveness in the first place. It was pretty clear. 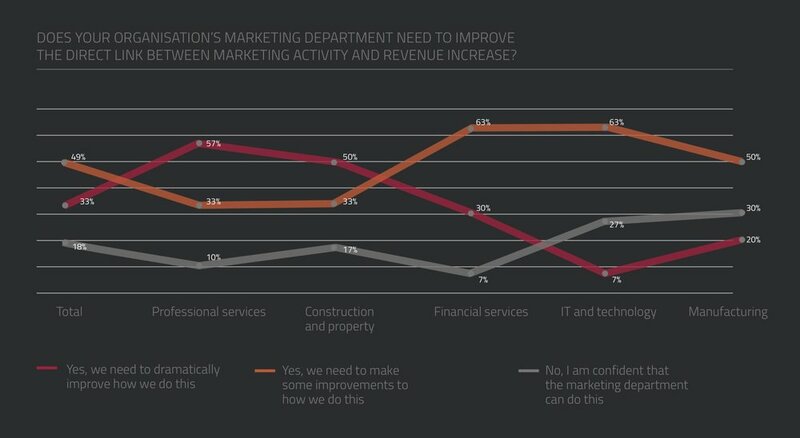 Over four-fifths (82%) of respondents say they need to improve the link between marketing activity and increased revenue. A third need dramatic improvement (and this leaps to 57% for professional services). Yet attribution itself, to put it mildly, is a mess. It’s not surprising. As already mentioned, determining which activity delivered which revenue is hard. Was it the top-of-funnel content that got someone on your radar? Was it the live demo that provoked a trial? Was it an influencer saying the right thing at just the right time? We see this confusion when we look at how B2B marketers attempt to prove effectiveness. Overall, a quarter use no attribution whatsoever. This increases to 40% of those in the construction industry and 30% in financial services. Surprisingly, as they’re normally the early adopters, tech also over indexes with 37% not even trying to attribute success. It is also more likely that there is no attribution in mid-market businesses than those in the enterprise space. But what about those who are trying to make the link? Many B2B marketers are employing a combination of measures. Most commonly used is when a lead initially converts (ie a contact is created in the database) – employed by 45% of respondents. This is closely followed by last touch (44%) and first touch (37%). Under a third (31%) use any form of multi-touch attribution, whether evenly split or weighted. While this could be seen simply as a sign of marketers just getting started with the easy stuff first, the implications of what you choose are worth further examination. Once marketing is tied to a particular form of attribution, it will inevitably skew their activity as they try to make the numbers. If, for example, you select initial conversion as your measure of choice, you will find yourself leaning towards tactics that fill the top of the funnel (or at least prop up the database). Conversely, select last touch and you will probably focus more on the bottom of the funnel and sales support. While no measure is perfect, it is only when you get to some form of multi-touch attribution that you can begin to take a more integrated approach, seeing which tactics have had an impact and which haven’t. Attribution has become another part of the ever-exploding martech stack of course. There are now a range of players who are offering systems and solutions promising to do the heavy lifting for you. Looking across our respondents, almost 60% are using something. However, no system exceeds 10% market share – so it seems like no vendor has nailed it yet either. If you have attribution in place, look at how the type(s) you’ve selected may be influencing the strategies and tactics you pursue. Begin making the move to some form of weighted multi-touch attribution – it won’t be perfect (especially in the early days) but it is better than simple guesswork and gut feel. Explore how technology can help but go in with your eyes open – be careful of getting locked in to just one system in this fast-moving sector.